He never appears during the day, always wears a mask, rarely speaks (and when he does, he disguises his voice), no one knows his real name, and he even vanishes when surrounded by police. I like to joke that he’s really Batman, though it’s later implied he’s a double agent. Also for the record: AO3 currently has 160 works of Les Mis fanfic tagged with Claquesous. This entry was posted in About and tagged Claquesous on April 30, 2018 by Kelson Vibber. Another parallel in introducing groups: Patron-Minette (the worst of the Paris underworld) and the ABC society. They’re explicitly linked in that they both work under the surface of society, one to improve it and one to prey on it. 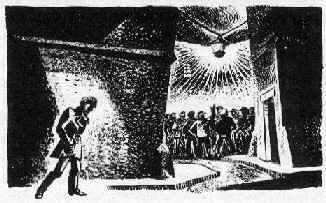 Hugo describes philosophers and political thinkers as miners, and criminals as underminers. This has gotten me thinking about the double meanings of miserables described in the first episode of the Les Mis Reading Companion, which I finally got around to listening to! Babet “underlined his smiles and put quotation marks around his gestures.” — that’s got to be figurative. No way do air quotes go back that far. I still think the description of Claquesous sounds like Batman. He is the night. Appears and disappears without warning. Always masked. Terribly mysterious. This entry was posted in Book Commentary and tagged babet, Claquesous, Patron-Minette on April 16, 2018 by Kelson Vibber. Grantaire holds court in a tavern, the barricade goes up, Javert is discovered (and is not alone!) and Marius has a very different experience making his way into the combat zone than his friends did. Everyone’s marching off to build a barricade…and now it’s time to describe the neighborhood in detail, including the entire history of the tavern Corinth next to where they end up building it. Because Victor Hugo, that’s why. It’s a different tavern than the students’ usual meeting place as revolutionaries, but it is one of their regular hangouts. The proprietor until recently, Pere Hucheloup, had been an excellent cook (who “may have been born to be a chemist”), though since his death, the place has gone downhill — especially the food. Courfeyrac had once written on the door: “Revel if you can and eat if you dare.” In short, it’s the 19th century Barth’s Burgers. On the morning of the revolt, Laigle and Joly are hanging out at Corinth. “The two friends lived, ate, and slept together, sharing everything, even the girl Musichetta from time to time.” Oh, myyy…. Grantaire shows up, so of course they spend the day drinking. He spends all his time rambling about drink, and reality, and revolution, and somewhere along the line it seems like he’s actually thinking about what he’s saying. Then he comes up with the idea that revolutions are God’s patches for continuity glitches. Hey, it makes more sense than Superboy punching the walls of time. Enjolras: Go home, Grantaire, you’re drunk! Graintaire: I will not be moved! Enjolras goes on to accuse Grantaire of being “incapable of believing or thinking or willing or living or dying.” Grantaire merely replies “You’ll see,” then proceeds to sleep through the entire siege. It actually is a good spot: Narrow, winding streets, the two-story tavern providing a staging area. They set up a huge barricade on the widest street, the Rue de la Chanvrerie, a lower one on the side street, the Rue Mondétour (literally “my detour”), and leave a tiny alleyway open for messengers. Just as this barricade is only a small part of the rebellion, the students are only a small part of the defenders. They’re in charge, but there are about fifty men at this point, workmen of all sorts and ages, armed with whatever weapons they could scrounge up. They’re expecting to face thousands of soldiers — yes, Thermopylae is mentioned. Javert doesn’t actually have a chance to do anything. Gavroche recognizes him as soon as he walks in the door. His ID lists him as “Javert, Inspector of Police, aged 52.” Does he even have a first name? Enjolras explains they’ll shoot him “two minutes before the barricade falls” because they can’t spare the ammunition. “You could use a knife,” Javert suggests. I don’t think this is the time for problem-solving, Inspector. Enjolras is offended by the suggestion. Javert also isn’t the only infiltrator. Hugo cites the fact that crowds, however high-minded their purpose, tend to attract violent men (this bit made me think of the Occupy protests), and a man called Le Cabuc shows up, tries to start a fight and shoots one of the townspeople who lives on the street. At this point, Enjolras steps in, declares that “Murder is an even greater crime here than elsewhere,” and executes him on the spot. Yes, with a gun, mere moments after telling Javert he can’t waste the ammo — because he has to make the point to maintain discipline. I spend a lot of time rolling my eyes at Marius. But then so do his friends, so I suppose it’s okay. After Éponine’s message, he decides he might as well go to the barricade. He told Cosette he’d die without her, and dammit, he’s going to keep his word! And hey, he’s still got Javert’s pistols from four months ago (not sure why he’s carrying them today), so he’s already armed. You’d think the police would keep track of them better. Marius’ journey to the barricade is really interesting. He starts in areas with ordinary Parisian activity, then walks through restless crowds, then through army staging areas, and finally deserted streets. Streetlamps have been put out. People are hiding in their homes. No one is out and about. “Marius enters the Darkness” isn’t just metaphorical, but literal. It’s downright creepy, and gives you a very different impression than the focus on the barricade allows. You get a little of the same sense later, in the flight through the sewers, but the anticipation here gives you a real appreciation of the state of the city. It’s also a far cry from his friends’ cheerful off-to-war march earlier in the day. An interesting point: They all know that the next day will settle the matter one way or another: Either the revolution will take hold and grow, or it’ll be quenched immediately. Marius comes to the barricade by way of the alley, and a step before he would be spotted by sentries, he stops, sits down, and starts thinking about his father, honor, and the nature of war. It’s his turn to die for his country…only he’s going to be fighting against his own country. Oops. But then isn’t all war civil war, of brother against brother? And yet isn’t war needed to stir up the crowd when it lapses into compliance? And of course it’s even more important to overthrow tyrants in France. Because France. Hugo states that humans have “the strange gift of being able to reason almost coldly in the most desperate extremity, so that in desolation and utmost despair, in the travail of our darkest meditation, we may still view our situation with detachment and weigh arguments.” Modern research suggests otherwise, that in periods of extreme or prolonged stress, we lose detachment and our reason is impaired. But if Hugo believes it, it certainly explains why so many of his characters get to monologuing. Pages covered: 915-952. Images by Brion and Lynd Ward from unidentified editions of Les Misérables, via the Pont-au-Change illustration gallery. This entry was posted in Book Commentary and tagged Barricade, Claquesous, Corinth, Courfeyrac, Death, Enjolras, Gavroche, Grantaire, Javert, Joly, Lesgles, Marius, Paris, Revolution on December 19, 2013 by Kelson Vibber. I’m re-reading Victor Hugo’s Les Misérables after 20 years. Start with part 1, go back to read about the revolutionary mood of 1832 Paris, or read on! Marius is utterly despondent after witnessing the attempted robbery. Cosette’s gone again, and he still doesn’t know her name — in fact, it’s worse, because he thought he knew it, but it turns out he doesn’t after all. He had to choose between his true love’s father and the man who saved his own father, and learn that the latter was vile and repulsive. Even now he can’t bring himself to testify against Thénardier, and actually sends him money in prison (even though he has to borrow it from Courfeyrac). He’s also stopped working and fallen into a vicious circle. At one point he wanders into a picturesque field that “because the place is worth seeing no one visits it.” But it’s called the Field of the Lark, and since he’s learned Cosette’s old nickname, he seizes on it as a sign. So from then on, whenever he gives up staring at the blank piece of paper he’s supposed to be writing on, he goes there. Montparnasse and Éponine apparently have…something going on. He escaped capture because he left early, “more in a mood to amuse himself with the daughter than play hired assassin for the father.” In a later chapter, he’s described as “perhaps [Thénardier’s] unofficial son-in-law.” It’s not clear how far it goes, though he’s more interested than she is. In any case, it’s odd that Hugo dances around this, considering how frank he is about, for instance, Fantine’s relationship with Tholomyes. Of course, they don’t let a “trifle” like being in prison keep them from running their criminal enterprise. They send messages back and forth between prison yards and out of the prison hidden inside lumps of bread, tossed over the wall. One of them gets wind of a likely house to rob in the Rue Plumet (sound familiar? ), contacts Magnon (M. Gillenormand’s former servant from 200 pages ago! 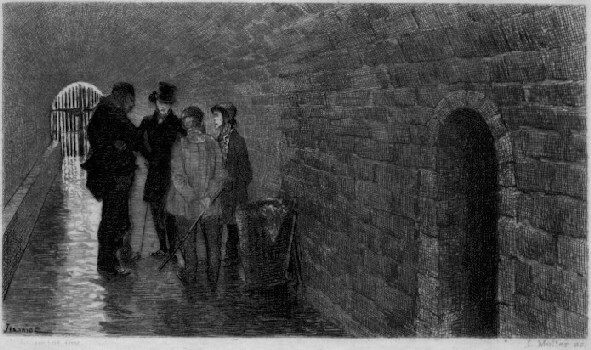 ), who sends Éponine to check it out. Éponine takes one look at it, and sends back a coded message about a biscuit, meaning it’s not worth the effort. But she knows someone else very interested in the inhabitants of that house. It takes Éponine a while to track Marius down. First she locates his old friend Père Mabeuf, the gardener and book-lover who knew his father. He’s fallen on hard times, and gotten old besides. The girl helps the old man draw water from the well, an interesting reversal of Valjean and Cosette’s first meeting. He calls her an angel. “‘I’m no angel,’ she replied. ‘I’m the devil, but it’s all the same to me.’” Her self-image needs some help. After he answers her question about Marius, he turns around and she’s gone. Later that night as he’s drifting off to sleep, he wonders if she was a goblin. Or maybe she’s Batman. She’s certainly got the voice. Though since she finds Marius at the Rivière des Gobelins, maybe Mabeuf was right. Since Marius has last seen Éponine, she’s been worked over by both poverty and puberty. It’s a bit awkward, and it’s kind of surprising that Marius even notices. She starts rambling about this that and the other thing, while he answers her occasional questions with monosyllables. She mentions that Mabeuf called him a baron. “You can’t be a baron. Barons are old. They go and sit in the Luxembourg, on the sunny side of the château, and read the Quotidienne at a sou a copy.” I guess this trope is older than I thought. My commentaries seem to be covering smaller and smaller chunks of text. I don’t know how much is the story getting denser, how much is the greater presence of interesting characters, how much has to do with it being so much easier to highlight a passage and come back to it later instead of commenting as I read, and how much is just seeing more connections because I’ve read more of the story so far. Pages covered: 739-755. 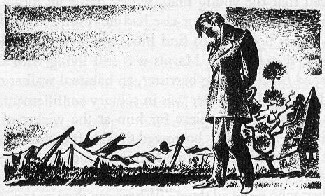 Image by Lynd Ward from an unidentified edition of Les Misérables, via the Pont-au-Change illustration gallery. This entry was posted in Book Commentary and tagged Claquesous, Courfeyrac, Eponine, Javert, Lark, Magnon, Marius, Montparnasse, Paris, Patron-Minette, Prison, Romance on September 22, 2013 by Kelson Vibber. I’m re-reading Victor Hugo’s Les Misérables after 20 years. Start with part 1, go back to read about Marius and Cosette’s sly meetings in the park, or read on. I’m back! I took a break to read Julie Czerneda’s foray into fantasy, A Turn of Light, which took a lot longer than I expected, then decided I wanted to read something short for a change, and plowed through George Takei’s Oh Myyy! : There Goes The Internet. Now I’m back to Les Misérables with a short commentary, because what I’ve got is quite long and this is really the only place to break it. In the next section, an attempted robbery will bring all the major players together. But first, we need to learn about the minor players who will be involved. The skeevy Boulatruelle from Montfermeil, who was only marginally less scary than Beelzebub, turns out to be one of their regular accomplices. One uses the alias… Bizarro? Yes, indeed — and it’s listed that way in the original French! Apparently it’s Spanish for “brave.” Which I probably knew and then forgot. Next up: Catching up with the Thénardiers. Pages covered: 619-626. 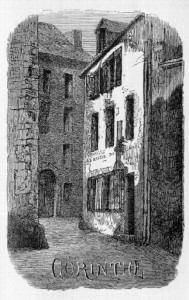 Image by Jeanniot from an unidentified edition of Les Misérables, via the Pont-au-Change illustration gallery. This entry was posted in Book Commentary and tagged Bizarro, Boulatruelle, Claquesous, Montparnasse, Paris, Patron-Minette on June 15, 2013 by Kelson Vibber.